In short, it's pretty extreme. (It's not non-stop gore, mind you, and there aren't actually that many murders. It's not Future Diary or anything. Satou's a nice, polite girl who doesn't actually want to hurt anyone and would like all the world to be happy. She's just, uh, a bit overprotective.) However it's also a study of people's ideas of love and how that can cross over into very bad places. Firstly, Satou's the protagonist. You might be wondering how a horrific character like that can be the heroine. Well, there are various factors. Firstly, she's likeable in a "watching the scary broken monster" sort of way. She has some hidden boundaries that you shouldn't cross and you should be frightened for anyone who spends too much time with her, but she's doing all this because of love. She didn't understand love. She tried sleeping around, but that didn't work. She had no one to emulate, since her only relative (an aunt) was an even worse role model than Satou. Then, though, she met Shio-chan and practically exploded with love for this adorable little angel. She'd love nothing more than to spend all day doting on Shio, cuddling her and giving her everything she wants. She works hard at part-time jobs to provide for of them. I'm pretty sure she never steals money, or anything like that. In most senses, she's a good person. Her long-term planning is questionable, admittedly. What would have happened to Shio, locked away and unknown to the world, had anything happened to Satou? Why isn't she letting Shio go to school? Is it healthy to be treating a six-year-old practically as a pet? 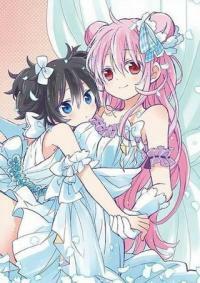 Those problematic issues aside, though, Satou's "happy sugar life" is all about loving Shio, thinking dreamily about Shio and eliminating any threat to her life with Shio. She identifies good things as "sweet" and anything that makes people unhappy as "sour". In a nicer universe, Satou and Shio would have lived peacefully together and no one would have died. In Japanese, incidentally, Shio means "salt" and Satou means "sugar". Alas, this isn't a nice universe. The show's full of crazy, evil and/or broken people, most of whom have their own ideas about love. (Satou's fairly sane compared with some of them.) As well as going to some exceptionally dark places, there's also abuse and other problematic content that some people might feel needed more sensitive treatment. Personally I'm fine with it, admittedly, but I point that out. It's not really going for "subtle", instead painting its psychological problems in very loud colours. A lot of the characterisation goes pretty extreme when it comes to broken brains, disturbing desires and so on. Realism isn't really on the menu. If this were an average cross-section of... well, anywhere, then mankind would be doomed. Don't expect a happy ending either. This is spoiled at the start of ep.1, when we see Shio and Satou commit suicide together. (A six-year-old committing suicide isn't even the worst thing in this show.) Ep.12 is thus a slow-motion car crash of questionable decisions heading towards a known endpoint, although that said I see the manga's still ongoing. Maybe I should buy it? I liked this show a good deal. It's pretty lurid, obviously, but it's also handling its extreme characters fairly and never claims, for instance, that Love Makes Everything Okay. (That's what Satou thinks, admittedly, but look at where it leads her.) The show doesn't try to justify Satou's actions, or indeed anyone else's. You're watching a monster, but you're also sort of cheering for her even as it becomes increasingly obvious that she's a human time bomb and in some ways the worst thing that could have happened to Shio. She's been so lacking until now as a human being that she'll be ecstatic in ep.3 on realising that she's jealous, because that's another feeling she's never known before and more evidence of her deepening love. Her idea of guilt is, uh, lop-sided. She has a strange definition of "telling everything". Despite everything, you realise that she does actually want to be nice to people and live a happy, peaceful life. "You said you'd accept anything and I believe you."